On May 7, 2014, Unilever and NRG Energy announced the formation of a strategic partnership. The goal? To source 100 percent of the energy used by Unilever’s United States operations from onsite and offsite renewable generation by 2020. During a recent two-day conference, managers from both companies reflected on the progress they’ve made and the lessons they’ve learned during the past year. The conference was jointly hosted by Yale Center for Business and the Environment, United States Business Council for Sustainable Development, and World Business Council for Sustainable Development. The highlights of the discussion are outlined below this video of the event. How does one of the largest multinational consumer goods companies decide to partner with a Fortune 500 electricity business to completely revamp its energy usage across North America? Well, if the Unilever-NRG Energy collaboration is any guide, they make the decision quite quickly. In December 2013, the two CEOs met for the first time to explore the possibility of a large-scale partnership related to clean energy. Less than six months later, Unilever announced its collaboration with NRG Energy. Of course, it helped that both companies were already committed to becoming leaders in the sustainable business space. In 2010, for example, Unilever unveiled its Sustainable Living Plan, which ambitiously set targets of doubling its growth and halving the environmental impact of its products by 2020. Four years later, David Crane – NRG Energy’s CEO – made headlines when he pledged to reduce his company’s carbon emissions 50 percent by 2030 and 90 percent by 2050. It became increasingly clear to Unilever that its bold dreams would require even bolder actions. Prior to the NRG Energy deal, Unilever’s United States sites had already offset their entire electricity use with renewable energy certificates (RECs). But the company knew that it would have to go beyond RECs if it wanted to play a transformative role in the clean-energy market. Hurricane Sandy also made a strong business case for setting big goals in the distributed renewable energy arena. 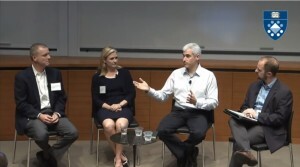 Business writer Andrew Winston speaking at Yale on July 16, 2015. At the same time, NRG Energy was struggling to find the big demand for renewable energy that would help catalyze its transition away from coal. NRG Energy and Unilever formed and announced their collaboration in record time. However, neither company knew exactly how they were going to achieve Unilever’s goal of 100 percent renewable energy by 2020. The “getting there” hasn’t been easy. The two representatives noted that their companies only just signed a master power purchase agreement (PPA) this summer. But the pace of their progress reflects the complexity of the challenges faced by both companies. Instead, Unilever is taking a portfolio approach. It will rely on a variety of clean energy technologies and energy-saving projects to reach its 2020 target. At the moment, everything is up for consideration, including – but not limited to – wind, solar power, energy efficiency, combined heat and power, changes to employee benefit plans, and making electric vehicle charging available to all of Unilever’s United States employees. Ultimately, however, both representatives stressed that the goal is to achieve cost neutrality – or better – across their whole energy portfolio. The financing, however, gets complicated quickly. To collaborate at this scale, both companies have had to change. In the case of NRG Energy, developing a comprehensive energy portfolio for Unilever required new levels of intra-firm communication. 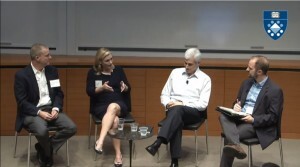 Lynda Clemmons, managing director at NRG Energy, speaking at Yale on July 16, 2015. For example, Clemmons highlighted the challenges of structuring contracts across sets of technologies that span multiple and often independent organizations within NRG Energy. These organizations may include the renewable energy group, the non-renewable distributed generation group, the various energy efficiency groups, etc.. In many respects, the partnership has pushed Unilever into uncharted territory. “We’ve never signed anything that long in Unilever’s history,” Atwood said, referring to the master PPA with NRG Energy. He added that moving the partnership forward required “a period of education” within Unilever, since the deal involved not only Unilever’s finance and sustainability divisions, but also staff in the procurement, communications, legal, and environmental health and safety departments. Strong leadership from the top was critical to overcoming these obstacles to collaboration. While both managers were quick to underscore the difficulties of collaborating at scale, they were just as quick to highlight the benefits of their partnership. Clemmons called the collaboration “a tremendous catalyst” for NRG Energy. The company has since signed renewable energy deals with Kaiser Permanente and Starwood Hotels & Resorts. And what Unilever’s employees are increasingly seeing is action. Clearly, Unilever United States and NRG Energy have an ambitious goal to reach during the next several years. However, Atwood said collaborations between NRG Energy and Unilever would expand beyond their current partnership. “I want to say that by 2030 we’ll be off the grid,” Atwood said. Note: Yale Center for Business and the Environment co-hosted this conference. Stuart DeCew, who is in a management role at the Clean Energy Finance Forum, participated in the panel discussion.